Antiques in the attic? Collectibles in the shed? The public can find out if they have trash or treasure in their trunks at this weekend’s What’$ It Worth? 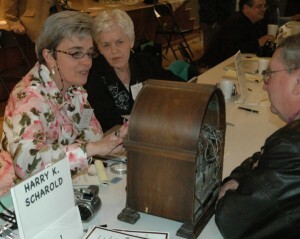 appraisal event at the Pioneer Museum in Fredericksburg, on Friday and Saturday, April 20 and 21. On Saturday from 9 a.m. to 3 p.m., independent appraisers will be on hand to gauge the value of treasures and collectibles, including furniture, paintings, sculpture, art, books, textiles, silver, glass, toys, guns, knives, vintage jewelry, clocks, and western and Fredericksburg memorabilia. They include: Glen Treibs, Fredericksburg Collectibles; Rachel Fitch, Estate Sales; Henry Umphrees, Red Baron Antique Mall and Estate Sales; Ron Woellhof, Showcase Antiques; Larry Jackson, Larry Jackson Antiques, Art and Estate Services & Consignment Sales; Harry Scharold, H. Karl Scharold Fine American Antiques, Inc.; and Doug Reaves, Western and Antique Firearms Collector and Dealer. Representatives of companies that provide services with antiques and collectibles will also be on site both Friday evening and all day Saturday. They include Fitch Estate Sales, H. Karl Scharold Antiques and Clock Restoration, Dennis Baltuskonis Fine Art Conservation Service, Fickel Furniture Restoration, and Lemon Tree Cleaners. Guests should bring their items to the Historic Sanctuary,312 West San Antonio Streeton Saturday. Appraisals are offered at $10 per item, with no limit on items. Large items can be appraised by bringing a high-quality photograph. A new Rare Find$ Market will be open both Friday and Saturday from9 a.m.until3 p.m.on the grounds. Select vendors will offer their unique items for sale to the public. There is free admission to the Market. Limited seats remain for the Pre-Event Cocktail Reception, held inside the Historic Sanctuary and Social Hall on Friday evening from6:30until9 p.m.Kenneth Hafertepe, Associate Professor and Chair of the Department of Museum Studies at Baylor University, will deliver a presentation on the 19th century furniture and decorative arts of the German artisans of the Texas Hill Country. Select restaurants Amish Market, Bejas, Chocolat, Dutchman’s, Fredericksburg Fudge, Navajo Grill, Sophie’s Choice, Sugar and Smoke, and Sunset Grill will serve hors d’oeuvres, drinks, and desserts. Guests at the Pre-Event Party will also enjoy door prizes and silent auction. Reception tickets are $30 for GCHS members and $35 for non-members, and include one free appraisal on Saturday.